The climate took a sudden dip today. Nature is such a teaser. woke up to a sudden chill. But hey, at least it was sunny. I'm craving for some hot soup. For some unknown reason my kids always eat well when I am making soup. So soup with dinner it is. 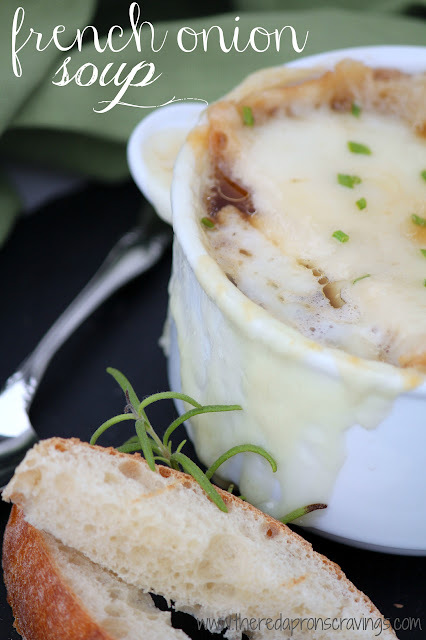 I made French Onion Soup on New year's Eve, and everyone loved it. So why not make it again. And leftovers would be perfect with a grilled cheese sandwich tomorrow. In a Dutch oven or a heavy bottom pot, melt butter on medium-low heat. Add onions, spread them out thin, cook, stirring as needed to keep them from sticking, until the onions are soft and golden brown, and caramelized. Dust with flour, cook for a good 5 mins. Add minced garlic, cook for 2 minutes. Season lightly with salt and pepper. Add wine, bring to a boil, and reduce by half. Add thyme and bay leaves. Add stock, cook partially covered for 30 mins. Meanwhile, lightly toast bread under a broiler and set aside. Discard, thyme and bay leaves, ladle hot soup into ovenproof bowls, filling the bowl almost to the rim. Place bowls on a baking pan, place 1-2 slices of toasted bread over each bowl of soup. Top with a good amount of grated cheese, place under the broiler until cheese is melted and crusty brown around the edges. I can't tell you how much I love French Onion soup. This look so good, sounds like a great recipe. Thanks for sharing! Wow, what a nice post ! Thanks for sharing your experiences with us. 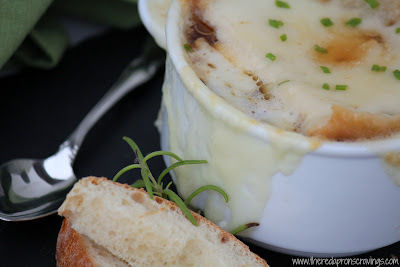 I love french onion soup . I like french cuisine food very much and i have tried many french recipes which i got from youtube and many other website. I like visiting French restaurants in weekend.